Many institutional investors are currently attracted by the potential for high yields on mortgage investments. Exposure to the mortgage market can be achieved in various ways, such as through a pool of mortgage loans or by investing in repackaged mortgage-backed securities. An interesting alternative approach is used in Denmark: in this country, mortgage loans are coupled to mortgage bonds that have a very high rating and can be traded in a liquid secondary market. 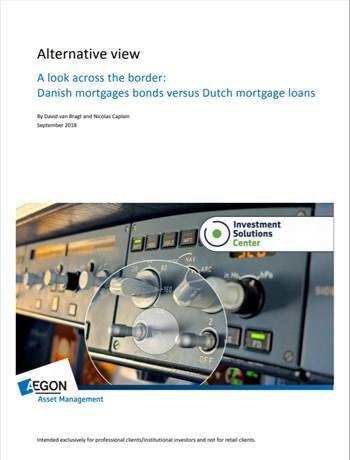 In this article, we compare Danish mortgage bonds with direct investments in Dutch mortgage loans. This analysis informs institutional investors about the distinguishing features of these mortgage markets. Written by David van Bragt, Senior Consultant Investment Solutions at Aegon Asset Management and Nicolas Caplain, Head of Fund Selection at La Banque Postale Asset Management.